Hello, lovelies~ Having bright colorful lips has been one of my favorite part of doing my makeup. Even though sometimes it would bother Mr. G if I put something too bright, lol. Anyway, I've been using this lip product recently and thought I should do a review on it. 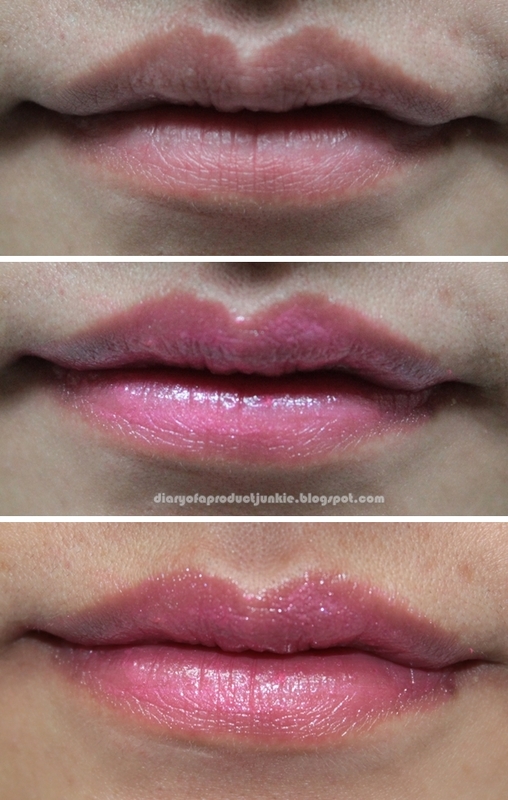 The Lip on Lip lipstick comes in a thin, white lipstick pacakging. However, it is smaller than your average lipstick pacakging. Well, it is slimmer. There are five shades to choose from, which are Scarlet Peach, Strawberry Red, Violet Pink, Ivory Orange, and Carnation Pink. Each of the lipstick comes in a 1.8 g product. When I swatched it on the back of my hand, I can see the hints of violet on the lipstick. However, I also noticed shimmers. 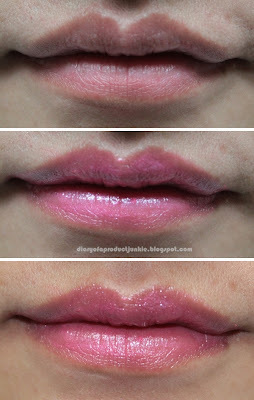 Now, I don't quite like lip products with tons of shimmers as they tend to smear and end up anywhere else aside from my lips. Since the color is gorgeous for a drugstore product, I'll let the shimmers slide this time. I find it applies easily on my lips, it just glides, ladies. I don't have to drag it back and forth to force the color on my lips. However, I can imagine this lipstick getting all mushy and soft in the hot weather. I haven't tried it first hand, though. It doesn't sink in to my cracks, as well. It doesn't feel drying on my lips as they are very moisturizing. For a cheap product, it's doing good so far. Now, moving on to the performance of this lipstick. Even though it is pigmented, the color fades like a typical lipstick. On my lips, it fades after around the 2 hour mark, given that I don't bite my lips or lick them. After a meal, they're definitely a goner. Overall, I say it is worth the price. The moisturizing factor of the lipstick and the colorful shades is just alluring to be bought. Granted, the staying power and shimmers are the things that slightly bothered me, but I'd say for the price, they're worth buying for an everyday lip color. If you don't mind reapplying them, of course.